Predator Free 2050 Limited co- invests in research designed to create breakthroughs in predator control and eradication. The Predator Free 2050 Limited Research Strategy is designed to develop, by 2025, a science solution capable of eradicating at least one small mammalian predator from the mainland; an important milestone on the road to a predator free New Zealand. It has been constructed by a strategy group through the New Zealand’s Biological Heritage National Science Challenge and has been independently peer-reviewed. The strategy will adapt and respond to research progress, new developments and the availability of funding. The initial priority components of the strategy are organised into four research programmes. A science breakthrough for Predator Free 2050 without a deep respect for ethics and the social license to operate is no breakthrough at all. We also need to understand the likely ecological and environmental consequences of our predator management actions, to best guide their application. Bioethics panel – An objective ethical assessment of predator management, including animal welfare, GM, philosophical, legal and cultural considerations, is underway through the Biological Heritage Challenge. Such results and advice will inform our ongoing research strategy. Social research – Discussion and consultation will also guide the strategy. A social survey on pest management, recently completed by the Challenge, will provide part of the starting point from which this conversation will progress. Cultural perspectives on predator management – New Zealand’s predator management goals, and the approaches used to achieve them, will be guided by Māori cultural concepts, values and perspectives. Ecological and ecosystem consequences of predator eradication – This will inform as necessary on the expected benefits of different management approaches, and the potential for unintended consequences such as possum control leading to increased rat numbers. While New Zealand is a world leader in predator control and eradication, keeping areas predator free is a challenge. This programme will see if advances with currently employed tools and approaches can make eradication at the landscape scale possible, initially for possums. Behaviour of survivors and rural/urban possums – Understanding the behaviour of possums that survive current control approaches, to make those approaches better, and informing how to efficiently and effectively eradicate possums from urban and rural landscapes. Aerial eradication of possums in back-country – Aerial 1080 bait application can now achieve high levels of possum control efficacy with greatly reduced non-target and environmental impacts. This will inform on whether improvements can achieve reliable eradication. Lean lethal detection networks for possums across all habitats – Developing optimised sparse landscape-scale networks of devices to detect (and possibly remove) individual possums at low density, for reinvasion prevention and eradication after imperfect control. Novel modes of toxin action – If further development of current landscape scale toxic bait approaches are unable to reliably eradicate possums, one possible avenue will be to explore how novel modes of action (such as toxin micro-encapsulation) could improve efficacy. On-board decision making / AI – Efficacy of devices to both detect and control predators could be greatly enhanced by algorithms allowing accurate real-time species identification. If such enhancement is needed, we will drive artificial intelligence solutions for possums. We are constantly assessing the potential of new tools for predator eradication. In the future these could include such areas as artificial intelligence, species-specific toxins and drones. Currently, new genetic tools such as ‘gene-drive’ are being discussed globally for pest management. However, these may be practically unfeasible, carry too many risks, or be socially unacceptable for a role in Predator Free 2050. This programme will consider knowledge gaps to enable informed consideration of options. Assessing potential utility – Mathematical modelling will inform on whether gene-drive could actually make a meaningful contribution to the eradication of real-world rat populations, beyond what could be achieved through other approaches. Underpinning rat genomic resources – Genome sequencing in collaboration with Genomics Aotearoa, the Biological Heritage Challenge and CSIRO will increase our understanding of New Zealand’s rat populations, including the feasibility of their potential genetic control. Technical genetic tool development for rats – Dependent on technological hurdles being surmounted, supportive policy, and New Zealand/international appetite to proceed, gene-drives may potentially be researched in the future for application initially to rat eradication. Read more about understanding gene editing here. The development of shared tools, which all communities and agencies contributing to Predator Free 2050 can use to design the right approach for their goals and environment. Realistic spatial models drawing on the latest information will be openly accessible for both general and ‘power’ users. A data-commons for Predator Free 2050 – Working with the Biological Heritage Challenge to develop the open-access sharing of predator management data across agencies and community groups, to build collaboration and alignment, and inform computer modelling. 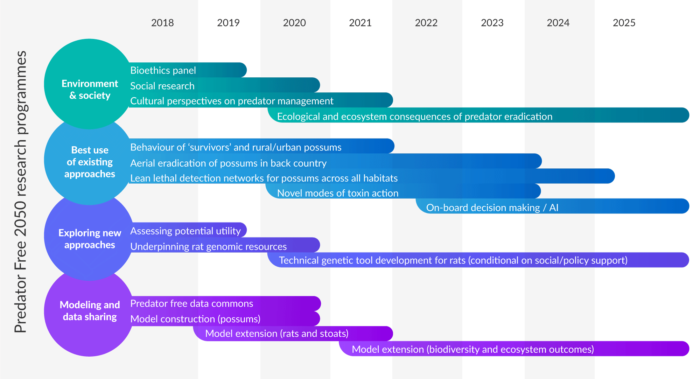 Model construction (possums) – Initially aligned to the ‘best use of existing tools’ programme, we will drive the development of models, software and interfaces for the exploration of different approaches to possum eradication at the local, regional and national scales. Model extension (rats and stoats) – Extension of resources to include the other Predator Free 2050 target species will draw on our understanding of their biology and management, and how they might interact with each other with respect to predator control application. Model extension (biodiversity and ecosystem outcomes) – Guidance on management outcomes will be provided by drawing on our existing knowledge and new understanding developed through both the strategy and predator management activities nationwide.